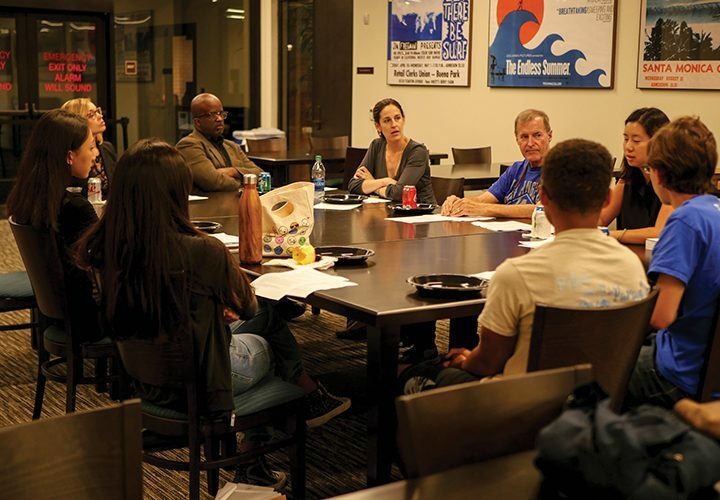 An information session and informal pizza dinner about the new Digital Humanities minor at Pepperdine was held Oct. 11 at the Kresge Reading Room in Payson Library. Program coordinator Jennifer Smith and other professors in the program were there to introduce the minor to students and answer questions. Digital Humanities is a field of study that integrates technology and humanities courses, such as literature and art. In the minor, students will be able to use digital tools learned in computer science classes to interpret and learn topics in humanities. The full description of the minor can be found in the 2017-2018 Seaver Academic Catalog. 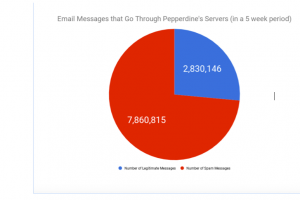 UCLA, USC and Loyola Marymount University are some of the universities in close proximity to Pepperdine that have a Digital Humanities program. Smith, Computer Science Professor Stan Warford and Art History Professor Lauren Kilroy-Ewbank explained the ins and outs of the minor and answered questions at the event. English Professor David Holmes and English Professor Jacqueline Dillion were also present at the session. Smith gave a brief overview of the new minor and said she felt this was one of the ways they could set students up for success. “The Digital Humanities minor is something that is near and dear to me. This gives students the opportunity to have two different skill sets coming together,” Smith said. Smith also spoke about its inter-disciplinary nature, and how the minor enables students to take courses opposite their field of discipline. A total of 18 units is required for the minor, which entails two required classes totaling six units; one computer science class, COSC 101 or 105 and one introduction to Digital h=Humanities class, ENG 225. The remaining 12 units are elective courses. In ENG 225, Smith said students will mainly learn the theory of digital humanities, its history and how it developed as a field, but also how to apply that knowledge in terms of textual criticism. In regard to the Computer Science classes, Warford said the classes offered through the program assume no previous programming experience, but are the intro courses taken by computer science and math majors. He also explained the differences between COSC 101 and 105. Smith said Pepperdine is one of the first to house a Digital Humanities program. She added that it is not common for universities as small as Pepperdine to have one. She also said computer scientists at many universities are not necessarily willing to work with the humanists, unlike at Pepperdine. “If you are a humanist and you are welcomed into the environment where the computer scientists are getting their foundation as well, that’s actually something really special, that you’re not getting some watered-down version of computer science,” Smith said. Smith recommended students who are interested in the minor to contact her directly because the vast majority of classes that will be available to students are not ones that appear in the catalog. “You won’t be able to see those classes in the catalog because they are predominantly linked to the faculty member that’s teaching them, as opposed to the class being offered,” Smith said. Smith said the reason for classes not being listed in the catalog is that Digital Humanities is primarily a methodology as opposed to a content area. Some classes will have a digital humanities flair, and others won’t, which depends on the faculty member’s area of expertise or interest. Smith also stressed the importance of taking digital humanities outside the classroom and said all digital humanities students should strongly consider doing an internship for their last three units. However, an internship is not required; students can complete another elective class in place of it. Smith said other options for an internship can be found in cultural art centers and museums in the area, or even abroad. Kilroy-Ewbank, who will be teaching the elective classes for the minor, spoke about a project in her digital art history class that embodies the purpose of the Digital Humanities minor. Similar to the information session, Smith said the idea is to have a recruitment and advising event in the fall semester and hold a more professional event in the spring. “We may potentially bring in speakers or do an internship event. The idea is one event every fall, one event every spring because we know you guys have your main major commitments as well,” Smith said. The program runs a Facebook page, where announcements and general information about digital humanities related news, jobs and internships will be posted. A website is currently in the works, and any questions can be directed to DH coordinator Jennifer Smith at Jennifer.Smith@pepperdine.edu.